A primer on London’s bright-burning young jazz scene, this new compilation brings together a collection of some of its sharpest talents. 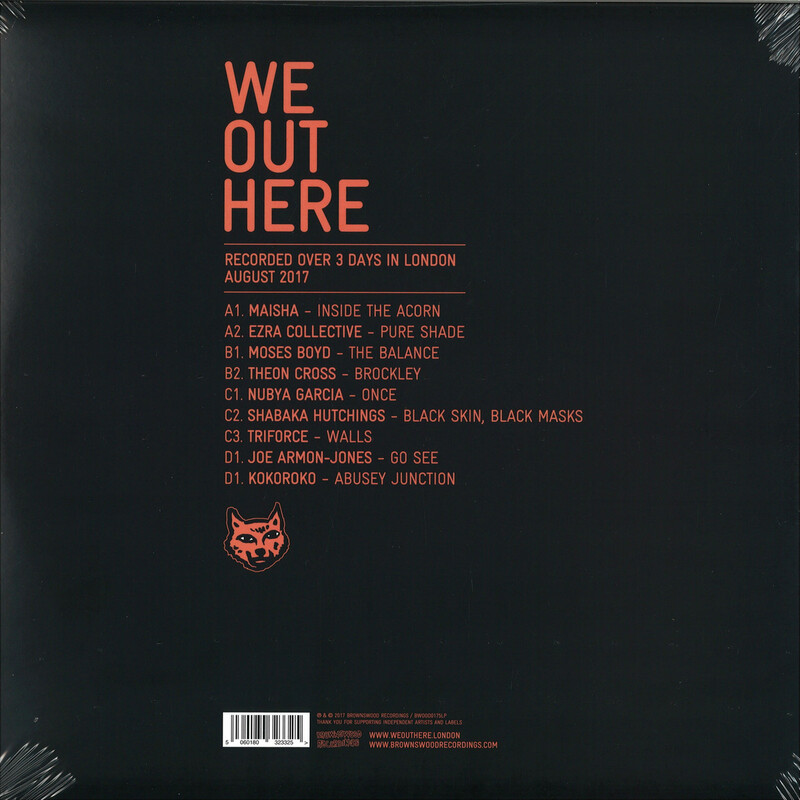 A set of nine newly-recorded tracks, We Out Here captures a moment where genre markers matter less than raw, focused energy. Looking at the album’s running order, it could easily serve as a name-checking exercise for some of London’s most-tipped and hardworking bands of the past couple of years. Recorded across three long, fruitful days in a North West London studio, the crossover between each of the groups speaks to the close-knit circles which make up the scene. 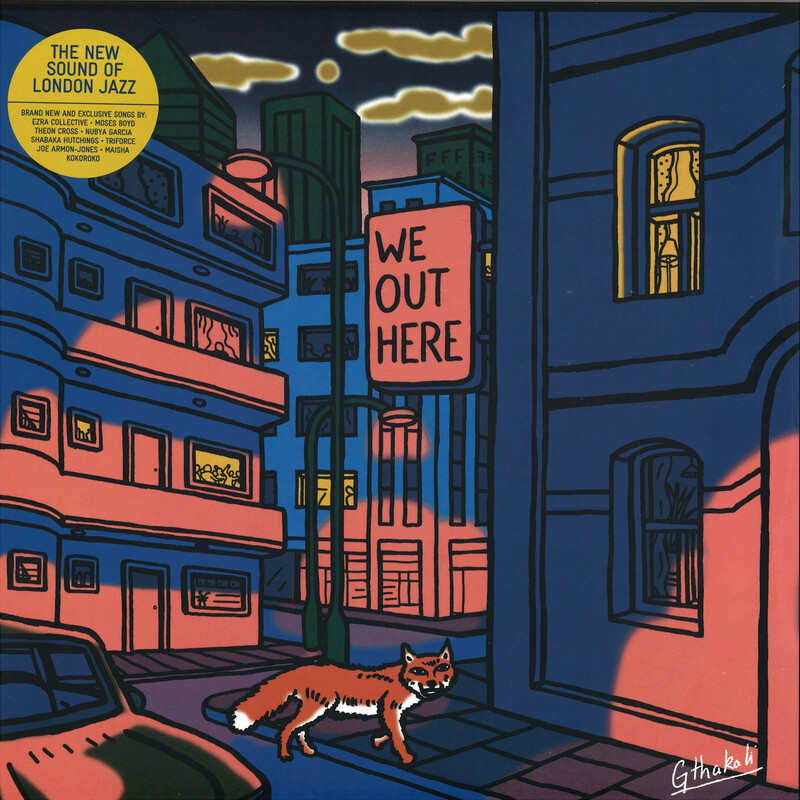 Surveying the way that London’s jazz-influenced music had spread outside of its usual spaces in recent years, this album bottles up some of the vital ideas emanating from that burgeoning movement. Giving a platform to a scene where mutual cooperation and a DIY spirit are second-nature, it’s a window into the wide-eyed future of London’s musical underground. Ubiquitous, much-lauded saxophonist Shabaka Hutchings is the project’s musical director. His own recent projects span from South Africa-connected, spiritually-minded jazz players Shabaka and the Ancestors to Sons of Kemet, who match diasporically-connected compositions with viscerally-direct live shows. His entry on the album, ‘Black Skin, Black Masks’, is typically difficult-to-define: with an off-kilter, shifting rhythmic backbone, repeated phrases — mirrored between clarinet and bass clarinet — shape the track with an alluring hue. His input ties together a deft, genre-agnostic sensibility that’s shared through all the players on the record. Theon Cross — who’s also part of Sons of Kemet with Hutchings — starts his track, ‘Brockley’, with the solo, distinctive low rumble of his tuba. Winding and mesmeric, it sees tuba and sax lines winding together in rhythmic and melodic parallels. Ezra Collective — whose drummer and bandleader Femi Koleoso has toured with Pharaohe Monch — run a tight, Afrobeat-tipped rhythm on ‘Pure Shade’, with the final third changing gear into a melodic, momentous closing stretch. Joe Armon-Jones, whose ludicrous chops on the piano have seen him touring with the likes of Ata Kak, showcases earworm-like, insistent motifs on ‘Go See’, balanced with a playful, improvisatory approach with room for ad-libbing and solos a-plenty. Taking a softer tact than many of the other entries, Kokoroko — whose guitarist Oscar Jerome has been making waves with his solo material — spin a lyrical, steady-paced meditation on ‘Abusey Junction’, matching chanted vocals with gently-played guitar. Nodding to spiritual jazz influences, Maisha’s ‘Inside The Acorn’ is a wandering, explorative rumination, balancing delicate washes of piano and percussion with sharp interplay between flute and bass clarinet. In contrast, Nubya Garcia’s ‘Once’ is taut and carefully-poised, her tenor sax guiding a carefully-built energy to an explosive conclusion. And finally, Triforce’s ‘Walls’ is a performance in two parts: starting with Mansur Brown’s languorous, lyrical guitar, the second half switches up to a low-slung, g-funk-tipped groove.